The fan-favourite birds are back with more exciting animated adventures as ANGRY BIRDS TOONS: SEASON ONE – VOLUME TWO onto DVD May 19 (today!) from Sony Pictures Home Entertainment. Welcome back to Piggy Island, where the Angry Birds’ survival is at stake! Join Red, Chuck, Matilda, Bomb, the Blues and Terence as they continue to hatch up schemes to foil the sneaky Bad Piggies who plot to steal their eggs. Based on one of the most popular games in history, ANGRY BIRDS TOONS: SEASON ONE – VOLUME TWO brings back fan-favourite characters for 26 more fun-filled adventures. Will our heroes defeat the mischievous Piggies once and for all? Toon in and find out! To celebrate the release of Angry Birds Toons: Season One – Volume Two on DVD today, Boo Roo and Tigger Too are lucky enough to be able to offer three lucky readers the opportunity to win a copy of Angry Birds Toons: Season One – Volume Two DVD as well as a copy of Angry Birds: Hatching a Universe 3D book. To enter simply tell me ‘who is your favourite Angry Birds Toon character?‘, then complete the Rafflecopter widget below. Additional optional entries are also available. 4. 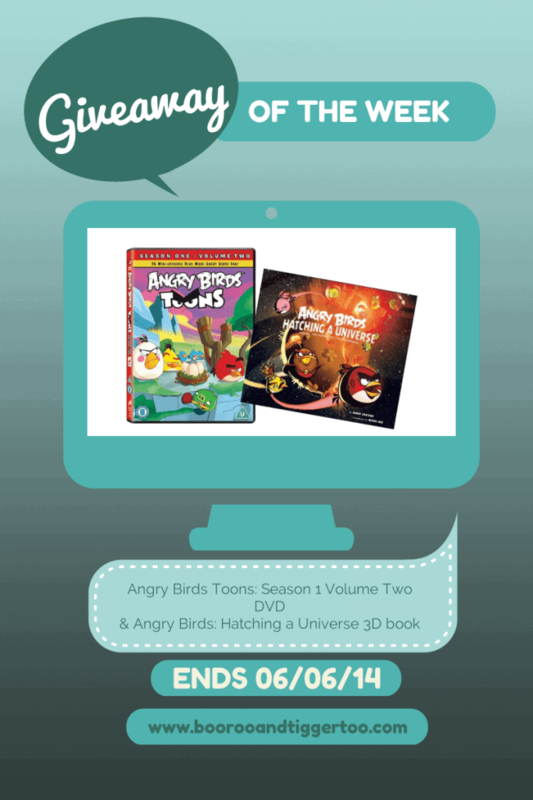 Three entrants shall receive a copy of Angry Birds Toons: Season One – Volume Two on DVD and Angry Birds: Hatching a Universe 3D book subject to availability. 10. Winners are required to make contact within 28 days, if a winner fails to respond a new winner will be selected. Disclosure: I have received no compensation for this post, just wanted to share a great giveaway with you. I love king Pig’s laugh! I like the look of Gale, I love a good antagonist! Stella. What a feisty gal. I’ve never seen Angry Birds but My nephew loves them.I’ve heard him mention Matilda. We’ve not seen it, but both my Son and Daughter love the games. Stella is my favorite angry bird. I like Stella the best. Has t be Stella – girl power!! We too love Pink Bird Stella. Stella cause shes a feisty bird at times.